Once you’ve written Chicken Schnitzel a few times it starts to look super ridiculous! Chicken Schnitzel. Chicken Schnitzel. Chicken Schnitzel. Teehee. Anyway! This delicious and easy, very easy, chicken schnitzel was a way to use up the last bit of Buttermilk in the fridge after making Possum’s Birthday Cake and also these delicious Pumpkin Buttermilk Scones. Every meal planners dream! No food waste! The weather in the mountains yesterday was cold and misty, perfect for a belly warming schnitzel teamed with creamy (and I mean creamy, I used pure cream and butter) mashed potato, roast pumpkin and steamed vegetables. Nom nom nom nom. 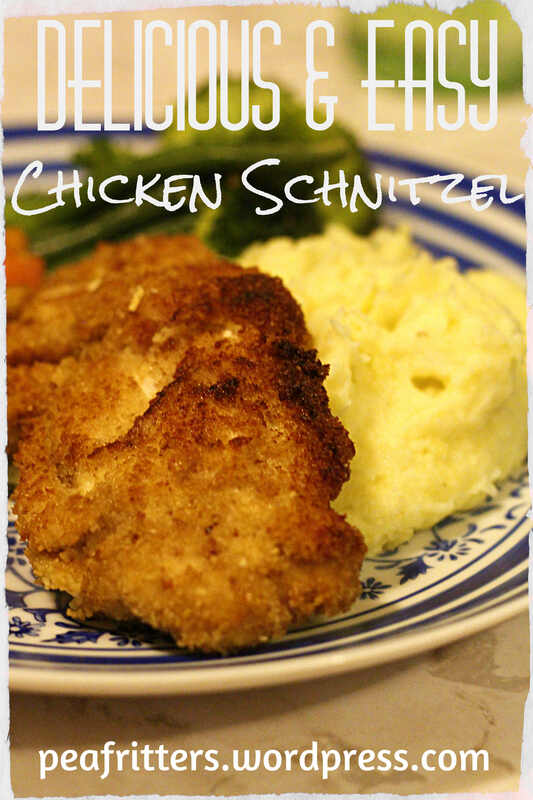 This version of Chicken Schnitzel is also egg free, so allergy friendly. Hurray! If you can’t do gluten you can substitute the bread crumbs for rice crumbs or gluten free bread crumbs. Rice crumbs actually turns out super crunchy. This would be a great meal to make if you had a bit of mummy anger going on after a rough day as you get to bash the chicken with something heavy. Just watch your knuckles! I learnt the hard way. 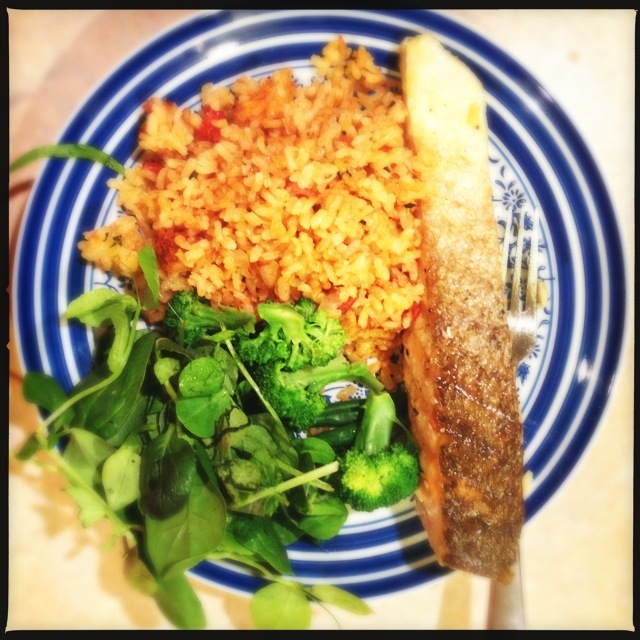 This is a lovely meal for the whole family to enjoy with enough variety on the plate to ensure something for everyone. I was thinking this would be a big hit with Possum as she loves chicken. But by the end of dinner she had eaten all her vegetables and wanted more vegetables but had hardly touched her chicken or mash. Clearly what her body wanted. Poor old mummy got to gobble up her serve of chicken schnitzel after Possum was asleep. Yes, I am a human seagull. Can I just say, as delicious as Chicken Schnitzel is, it ain’t very photogenic. 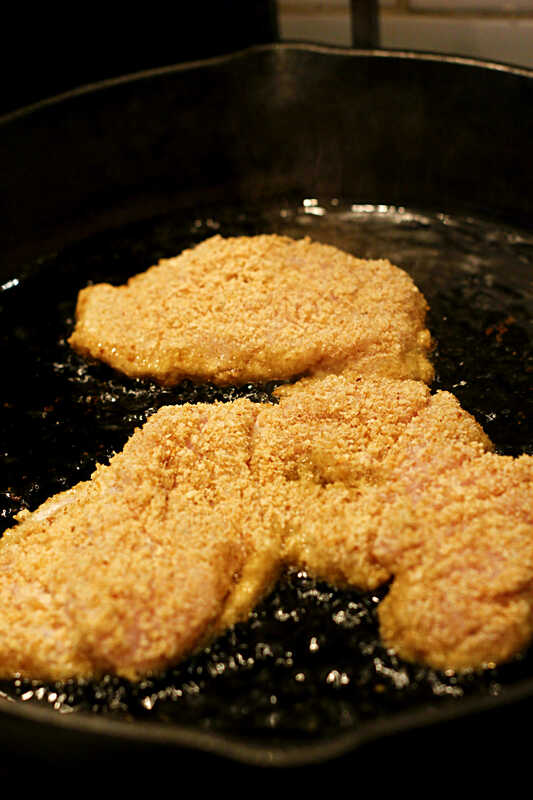 But the photo below shows you my secret weapon to a good Chicken Schnitzel. My marble rolling pin. This also doubles as my home security system. This baby has some serious weight to it and flattens out a chicken breast in minimal time and effort. Possum was also using it to practice her weight lifting skills (with my very nervous supervision). 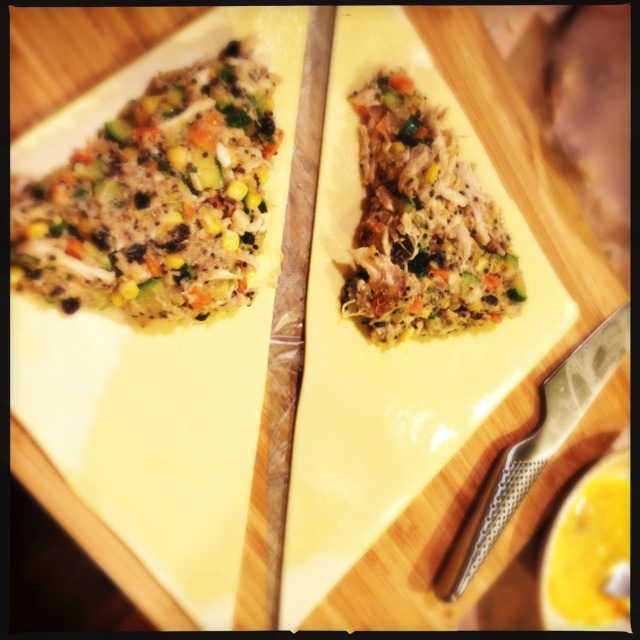 After you have sliced your chicken breasts lengthways, lay down a large piece of baking paper, place 1-2 chicken pieces on the paper, then cover with another equal sized piece of baking paper. 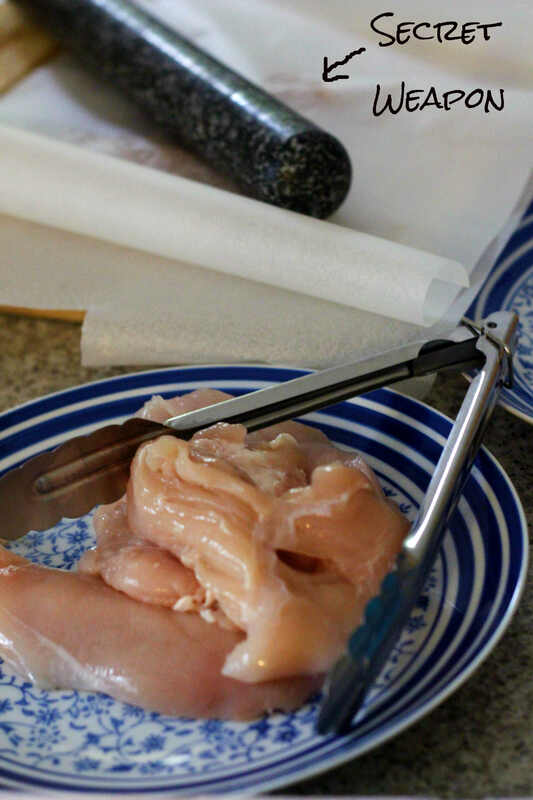 Use something heavy to hit the chicken (thanks to my marble rolling pin I don’t have to hit very hard) until the chicken is 5-10mm thick. Set aside flattened chicken and repeat with remaining pieces. In a bowl mix together buttermilk, mustard and salt and pepper. Add chicken pieces and stir to coat. Allow to soak for 30 minutes. Then, using tongs, remove each piece and coat in bread crumbs. To make this easier I place the crumbs on a dinner plate, starting with ~1 cup, and add more if needed (another little kitchen hack is to place crumbs and chicken in a plastic bag and shake to coat). Place crumbed pieces on a clean plate ready to cook. Meanwhile get your vegetables sorted. I roasted pumpkin pieces in the oven at 180°C in some olive oil, boiled some potatoes (ready for mashing) and steamed some broccoli, beans and carrots. When you’re ready, heat oil over medium heat in a non stick pan, preferably cast iron (I love my cast iron pans). There should be about 2mm of oil in the whole base of the pan. Place 1-2 chicken pieces in the hot oil. Cook for a few minutes each side until beautiful and golden. Place cooked pieces on paper towel. Repeat with remaining chicken. Serve with all your delicious veg and enjoy! What do you call this love? Chops and veg. Easy right? Foolproof dinner of Australian household since the first fleet arrived (nor based on any truth). Then how the &*%^ did I manage to stuff them up. Again. I’m blaming the oven/grill. 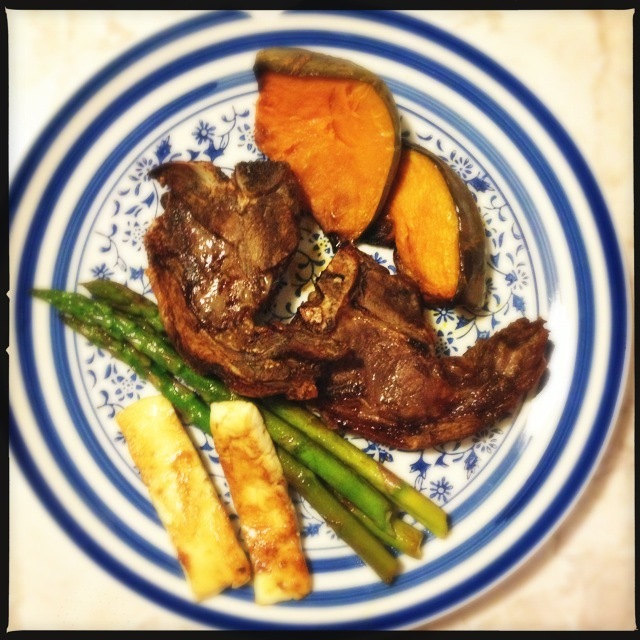 I used to rock a lamb chop at our old house, with the trusty no frills rental stove, with separate grill. This new house has one of those kinda fancy in the wall ovens which is a grill as well. The oven is great, love the fact it’s off the floor so Possum can’t touch it. Hate the whole grill side of it. Is the door meant to be open?? But if it is, that’s a whole lot of door that’s open. Plus there are two settings; maxi grill (sounds like a fire hazard to me) or fan grill (what??). Neither of them cook chops well. It’s like you’re baking and grilling at the same time, so my poor little chops end up like jerky at the end. And not in a good way. 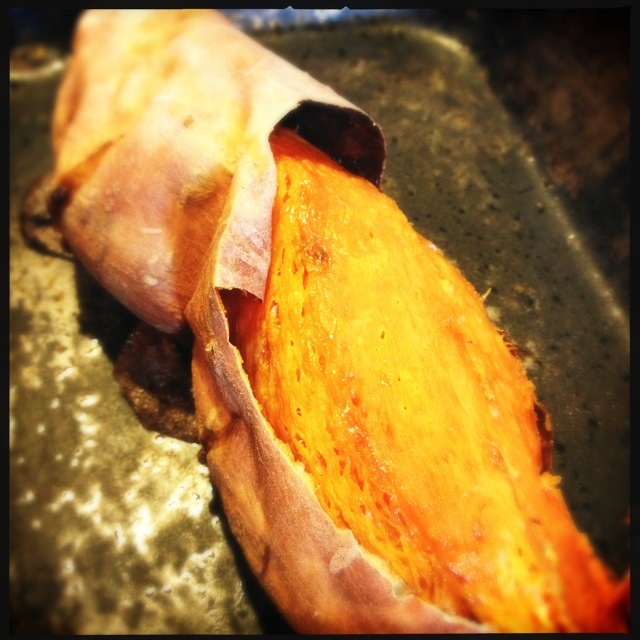 Thank goodness for leftover roast pumpkin! The moisture made sure chewing the chops didn’t sap every last drop of saliva from my mouth. Such a disappointment. These were nice organic chops too… As a side note, organic only tastes better if they’re cooked properly! On impulse I bought some haloumi this week. At least chewing that made me happy. It makes a noise like you’re walking in snow. That sound always makes me smile. At least initially. Then I get sad that I’m so far away from snow. One day I’ll go skiing again. One day. I used to live on the Isle of Man, doing the whole work travel thing. I was there for 8 months. While I was there I went skiing in France (the second time I’ve been skiing in my whole life). I came back on such a high. Swooning over how much I love snow. Snow snow, wonderful snow. Speaking to Legoman on the phone early one morning (we were doing the long distance relationship thing, it can work!) and basically I wouldn’t shut up about how much I loved snow. Then I hung up the phone, opened my curtains, and what lay before me? But the most wonderful thick blanket on newly fallen snow I’ve ever laid eyes on! And it was still falling! I ran up and down the corridor of the nurses quarters in my pyjamas knocking on doors and calling out “It’s snowing! It’s actually snowing!!”. Then donning my ski gear (yes I bough ski clothes, in the hope I will get to wear them again one day) went out at 6am to frolick, take photos and watch bewildered as people were attempting to drive. Oh how I loved that day. It was only bettered when something similar happened here in the Blue Mountains last year. I woke up to a light falling of snow, but none settling. I am super scared of driving in snow so called work to say I’d wait until it stopped to come in. 6 hours later it stopped. 15cm deep. AWESOME!! Snow and no work! I was pregnant at the time but early enough my ski pants still fit! They got another wear! Affordability : MODERATE. As far as meat goes, chops are a cheap alternative. But a waste of money when you cook them poorly! Time Factor : MODERATE. Normally you would grill your chops while you roast some veg, using one grill and one oven. What do you do when it’s an all in one??? Someone please help me out here! Deliciousness : Normally HIGH, can’t beat a good chop. Tonight, LOW, anything beats a bad chop. Mess : MODERATE. I always think this is a low mess meal. Until I go to use the grill again… hello lard. Tummy Filling Factor : MODERATE. A good meal to fill up on vegetables. An unhappy and unwell Possum tonight meant the veg selection was a bit average. Possum Friendly? YES. Cut off some meat to give yo you bub, or if the bones are safe for your baby, give them the whole thing to chew on! Red meat is great at any age, even as a first food! (And who said you had to have iron fortified cereal!). 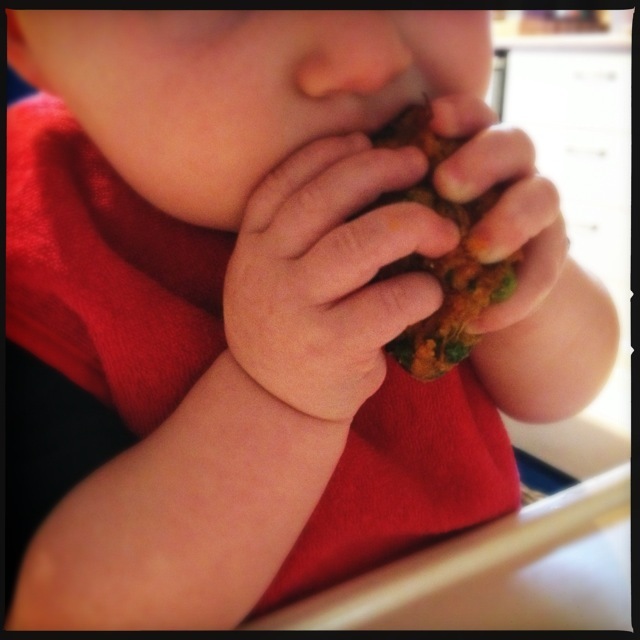 Roast veg are also a great baby led weaning food. Save time and hassle and cook a big tray. Would I make it again? Yes, and hopefully next time it will be edible. My wonderful day of getting things done was followed by today, a day of getting only a couple of things done. We did get to music playgroup though, and on time too! Huzzah! I had a bean and beetroot burger planned for dinner but time just didn’t allow for it today and I didn’t seem to have time to do prep during the day (maybe the nice nap with Possum this afternoon and getting an awesome new baby wrap had something to do with it…). So a last minute decision was made to make Rainbow Fridge Clearout Stir Fry. I reckon every house has their own version of this. The same way every house does spaghetti bolognese different. They are both tasty, easy meals that are a great way of getting rid of stuff in your veggie drawer. So what went into ours? First into the pan went: Coconut oil, 1 brown onion sliced, 2 cloves of garlic crushed, 1 long green red chilli cut thickly, 1 stem of lemongrass finely chopped. 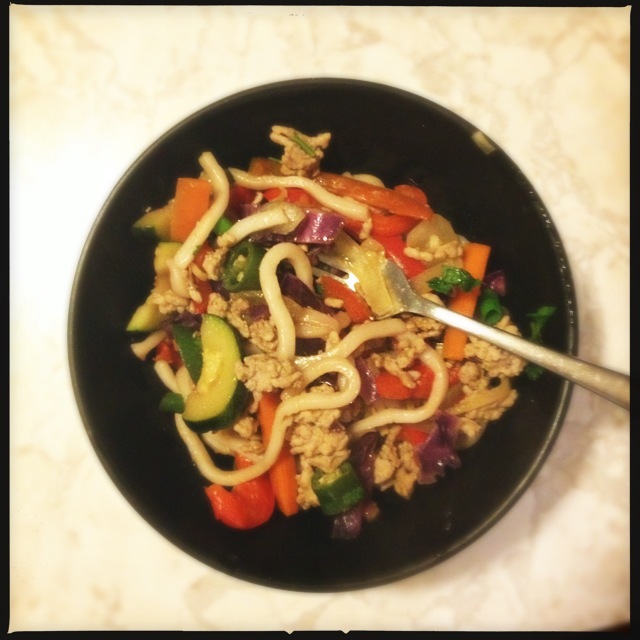 Then went in: 500g pork mince, 1 Tbsp kecap manis, a few drops of sesame oil and 1/2 Tbsp sweet chilli sauce. Cook until meat it done, then remove from the pan. Then add: coconut oil, 1 sliced zucchini, 1 sliced red capsicum, 1/4 of a red cabbage, 2 carrots cut into matchsticks and a handful of green beans cut into 1/3. Cook for a minute then add 1/2 cup of stock (I got to use my homemade chicken stock from yesterday). Cook until vegetables are nearly to your liking. Then add: 3 small packets of udon noodles, some more kacap manis, sesame oil and sweet chilli sauce. Push the noodles into the liquid to help break them up. Mix through. Then add: your meat and onion mix. Then add: chopped spring onions and chopped coriander. I went a bit light on the sauces and seasoning as I’m hoping this will be something Possum can eat tomorrow. Affordability : EXCELLENT. You’re using up stuff that would otherwise go off, so as cheap as it gets! A great oppurtunity to get creative with flavours in the kitchen! Time Factor : EXCELLENT. Chop and mix and you’re done! We don’t have a wok yet but that would make things even faster (though I did read today it’s healthier to cook your veg slowly so the oils your using don’t oxidise and become unstable). Complexity : LOW. Make it what you will but no real instructions needed. Deliciousness : MODERATE. Tummy filling, vegetable laden goodness. I love noodles. Mess : LOW. One pan wonder. I like to get a bit TV cooking show, and have my veg prepped into bowls in the order they will be added ie onion etc in one and chopped veg in another. Tummy Filling Factor : MODERATE – EXCELLENT. A bit more meat/protein would fill me up more, but still satisfied. Possum Friendly? YES. Keeping the salt low with homemade stock and minimal sauces means this will be a good option for Possum. I made sure the veg were cut into shapes that are easy to handle and safe to eat eg carrots into matchsticks not discs. I’m hoping the chilli in it isn’t too much for her. Would I make it again? Yes, of course. Everyone will! Sunday is our family day. I am always a bit mopey Sunday night knowing it is another 6 days until I get another one. But gotta make the most of what you’ve got, so tonight was a lovely roast leg of lamb. A perfect match to the cold drizzly weather outside. We had friends visit today (one from overseas), hoping to see a view, any view. All they got to see was our backyard, and I mean that in the literal sense, not the proverbial. Sunday is also my grocery shopping day (leaving Lego Man and Possum to hang out together for a couple of hours). My local fruit and veg shop had another wonderful $2 box today. 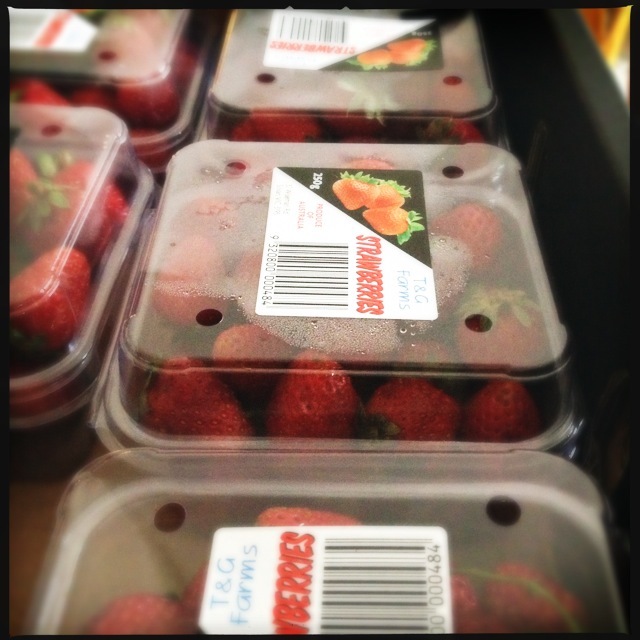 6 punnets of strawberries!! 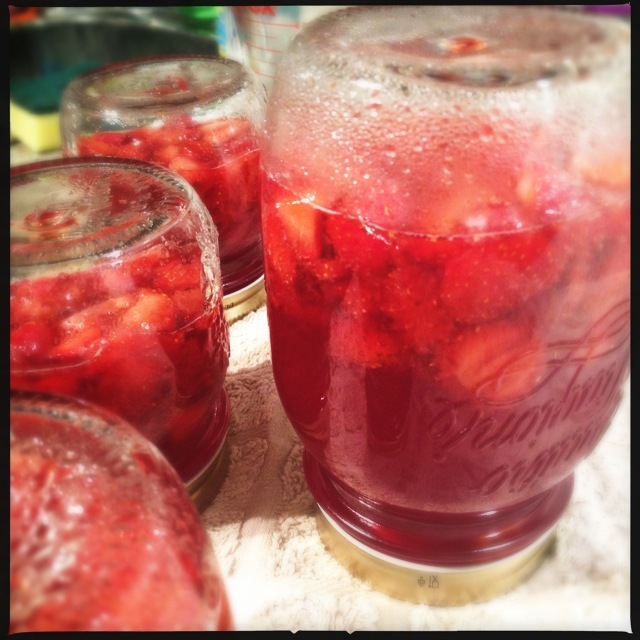 So my extra little project this evening was to make strawberry jam, using a box of lovely jars I bought a few months ago. 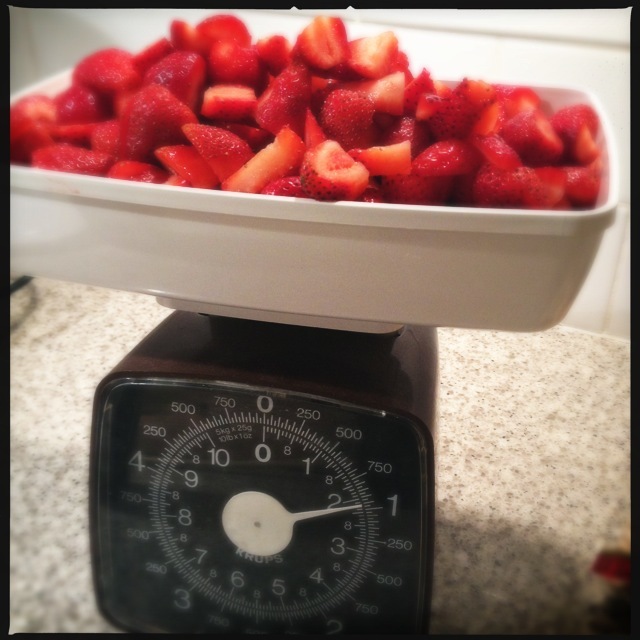 The fruit came to nearly 1kg once mouldy bits cut off and stems cut. 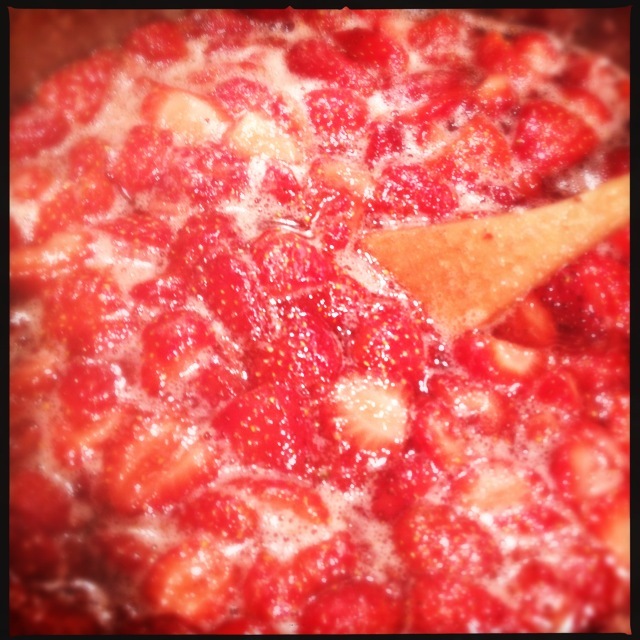 I did what any modern gal would do and googled how to make jam. I followed some instructions from the SBS food site with a bit of input from the instruction booklet that came with the jars. And then the moment of truth! The jam is super sweet, and there is a tackiness to it, which I hope equates to some level of setting. Tomorrow’s morning tea will be the test. The instruction booklet told me to put the jars upside down for at least 15 minutes… so here is the final product! But back to the main course. 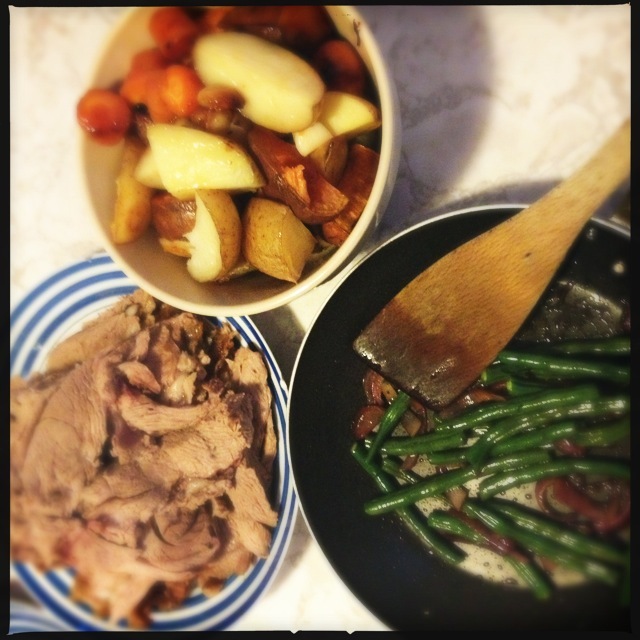 Lovely roast leg of lamb, with a selection of veg that needed eating from the fridge. A roast really is a timeless classic, unless your vegan, then it’s probably a horrible slap in the face with delicious meat. There a endless ways to flavour your roast, but tonight I stuck with the classic garlic and rosemary. I cut slits in the meat and push garlic cloves in. Not enough according to Lego Man. One day I shall cook 100 Cloves of Garlic Chicken. One day. The potatoes weren’t my usual awesome roast taties, but the carrots and sweet potato absolutely made up for it. I attempted to make gravy, but ended up with a tray of hot oil and lots of fried blobs of glue. Oh well. Affordability : EXCELLENT. The meat can be a big upfront cost, but you get a lot of leftovers with endless possibilities! Use veg to plump out the meal to your liking. Tonight was potato, sweet potato, carrot and green beans. Time Factor : MODERATE. Minimal prep but long cooking time. 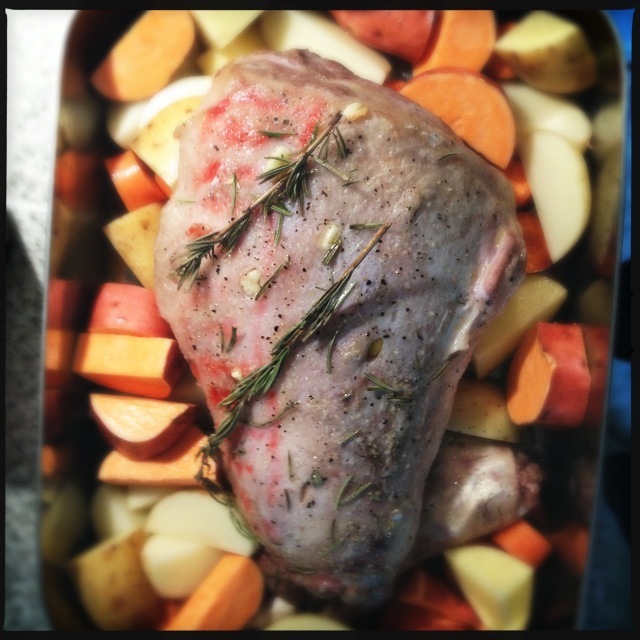 Roast was, well, roasting, for 2 hours this evening for a 2.5kg leg. Complexity : LOW. Anyone can cook a roast! Really, it’s true. Ask Paul Kelly how to make gravy though, as I haven’t a clue. Deliciousness : EXCELLENT. Yummy yum yum yum. Lego Man carved the meat so got the gnaw the bone. But we did share the best bits around the edges that are both crisp and juicy. I could never be a vegetarian. Mess : LOW. One pan and an extra for the beans. Too easy. Tummy Filling Factor : MODERATE. Pleasantly full. No dessert needed. Though I wouldn’t say no. Possum Friendly? YES. Possum loves a bit of roast lamb and she likes her roast veg too, so an easy meal for her tomorrow. Hurray! Would I make it again? Of course. One day I will get adventurous and do a different seasoning. One day. In Possum news, she pulled herself up to standing at the couch all on her own today! Eeeep! Possum loves shopping day as there’s always new things to discover. Right, we are back on track….ish. We are in a new place, with piles of boxes to unpack, a kitchen for tall people and a bub who’s commando speed is similar to a slug. So with the few cookbooks I could find, I sat down and wrote my plan for this week. You probably noticed that I am using two cookbooks mainly this week. I love both of these books dearly. Looking through Plenty for the first time since having Possum, it might be a while before I can make alot of the stuff in it. It is a vegetable (not vegetarian) cookbook. 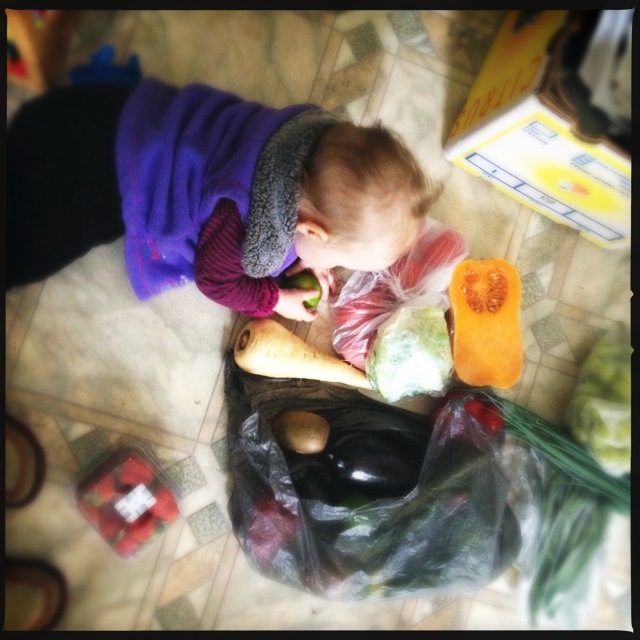 And vegetables need good timing, something not always possible with a bubba. The Leon book is actually their second cookbook. The first is much better than the second in my opinion, but I love their styling and the recipes are no fuss real food, as is their store’s philosophy. If ever you make it to London, search out a Leon store, and pack me in your suitcase! A moment to be a proud mummy. Tonight Possum had spag bol sauce for dinner. Not with a spoon. But with her own two hands. She ate a small bowl of the stuff. And the mess was so much less than expected! Hurray! My baby girl is growing up. Sigh. Smile. There’s a famous quote… “Even the best laid plans something something something something”. That was today. The plan was for salmon (I was going to cook it in the oven in foil parcels with maple syrup, soy sauce, sesame oil, shallots and ginger) with Brocolli Crunch. But by the time it was dinner, inspiration and energy were running low. It took me 1.5 hours to get Possum to sleep 30 minutes this afternoon. That’s not fair on either of us! So tonight Lego Man and I combined forces. Me at the grill pan with the salmon (just salmon, nothing else) and Lego Man at the microwave with left over risotto and some green veg. With our powers combined we created, an edible dinner. 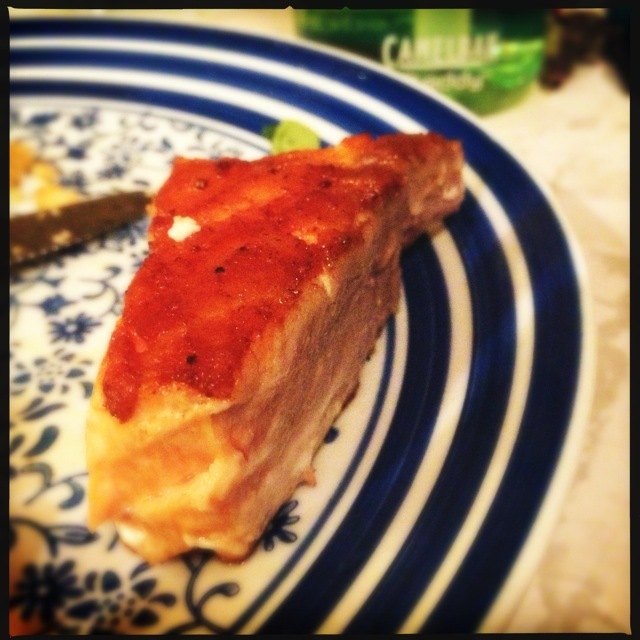 I undercooked the salmon as per usual, but some extra minutes in the pan created the best crunchy crust. The risotto was still super delicious and the vegetables were cooked to microwave perfection (and no I’m not being sarcastic, there’s a knack). Affordability : MODERATE. Salmon ain’t cheap! But it’s tasty and I’m looking forward to offering some to Possum. Time Factor : EXCELLENT. Dinner in 10 minutes. I filled the 10 minutes with eating chips and drinking wine. Complexity : LOW. The key to good veg in the microwave is not much water and in the right container. And once again, better to undercook them than over cook. Deliciousness : MODERATE. Not fancy but still pretty tasty. Possum Friendly? MODERATE. Will offer the salmon, she loved tinned salmon so fingers crossed. Would I make it again? Probably, on another day like today. But it probably won’t be salmon, instead it’s probably going to be “fish in a box” from the freezer. Possum Update: Korma curry HUGE success. She scoffed it down at lunch and dinner. I like that it offers her a variety of vegetables. 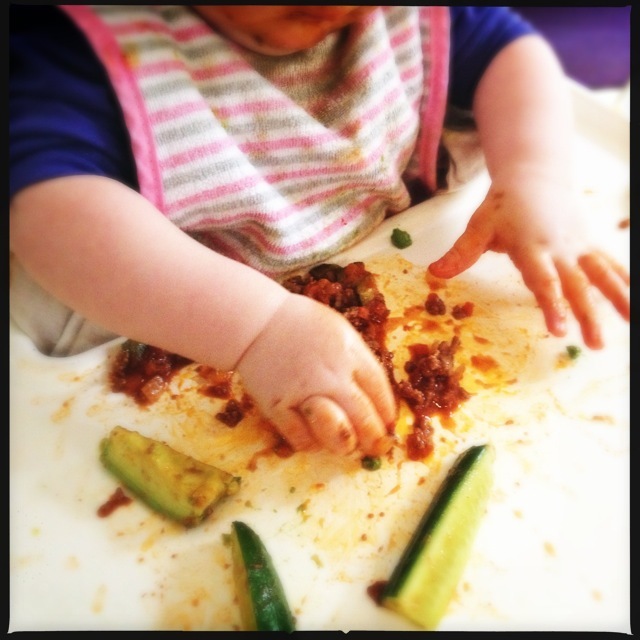 She seemed to like that too and her little hands hovered over her high chair tray like an eagle hunting for food, diving down when she laid eyes on the bit that she wanted most. Happy Valentine’s Day everyone! ❤ I hope you found time to offer a loving sentiment to someone around you. Best kind of love is unexpected, so surprise someone and be unpredictable! We didn’t do anything for Valentine’s this year (apart from Lego Man sharpening my knives and showing me the card he bought still in its plastic wrapper). But we managed to sit down together and share a meal at 9pm after a long day for both of us. We have no TV so meal time really is time to connect again, and I am so grateful. Thankyou to my parents for bringing me up eating meals at the dinner table. Today’s dinner is a mish mash of leftovers and fridge clearing. I like to call them “Love Puffs”. I mixed together the last of the roast chook, the croquette mix and some chopped veggies. Piled the mix on some puff pastry from the freezer and voila. Fancy leftovers. 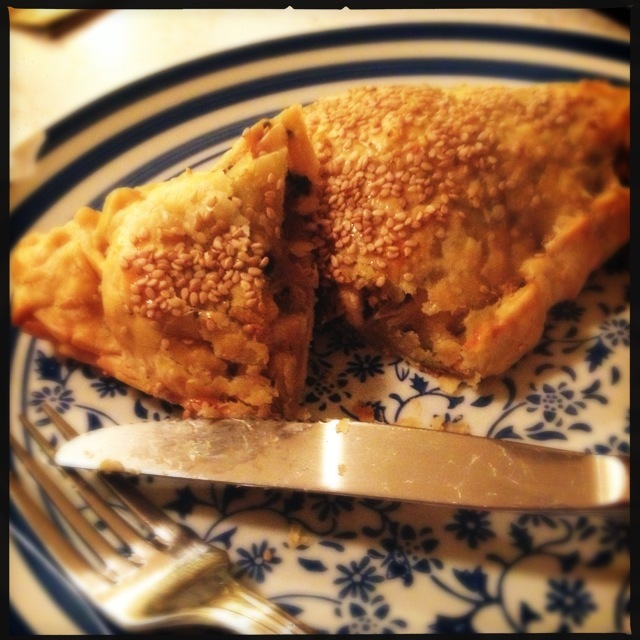 Put anything in pastry and it becomes oh so slightly fancy. Having puff pastry in the freezer is a good back up plan to make leftovers into pies and quiches. When working with frozen puff pastry you need to be pretty speedy so that the pastry is reasonably easy to work with. Cut into your desired shape (triangle for tonight), pile on your filling, brush the edges with a lightly beaten egg, then fold over or around your filling. 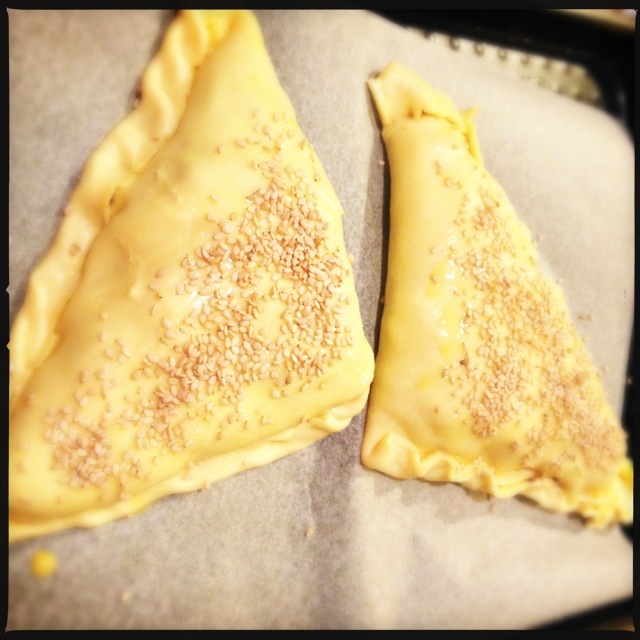 For a golden finish brush the pastry with the egg mixture and sprinkle with something pretty (like sesame seeds). Today I also made some little patties for Possum, hopefully that are kind to her tummy. 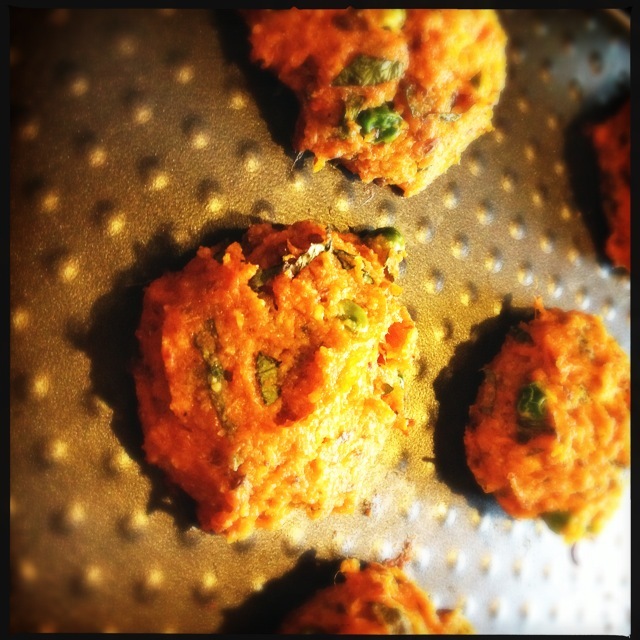 They are a combo of roast sweet potato, grated carrot (turns out Possum is petrified of the food processor), grated pear, garam masala, parsley (should’ve used coriander instead), a little oat bran, LSA and brown rice flour to add a bit of stick. Oh and green peas. She quite likes the challenge of picking up and getting them into her mouth but then chomps them once and spits them out again. Good practice I figure. Affordability : EXCELLENT. Leftovers for the win. 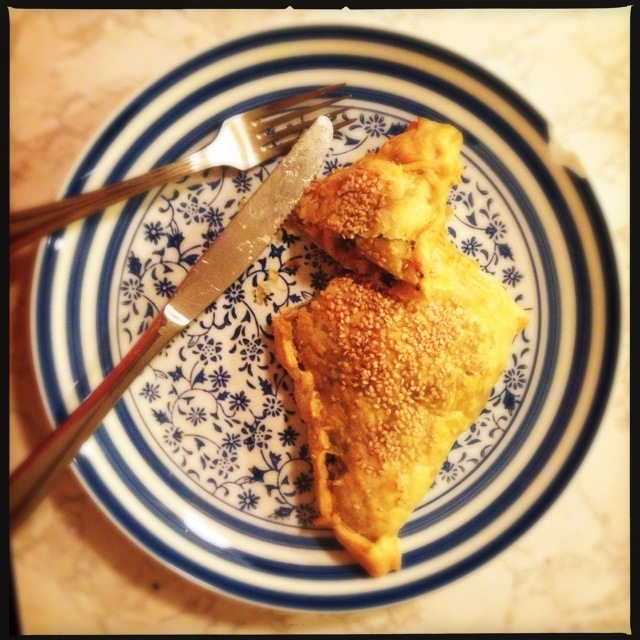 I use butter puff pastry (which is a bit more pricey) because I don’t believe in margarine. Time Factor : MODERATE. ~30 minutes prep plus 30 minutes oven time. Thankyou Lego Man for washing up while I cooked. It was a late one tonight, we were all running late. Complexity : LOW. Cook your veg quickly, mix leftovers together. Slap onto a bit of pastry. Mould into unrecognisable shape. Whack on some egg and fancy stuff. Chuck in the oven. Deliciousness : MODERATE. Not as tasty as the croquettes but redeemed with green tomato pickles. Mess : MODERATE. Ended up painting the chopping board with raw egg plus had messy chicken hands from stripping the meat. Minimal mess otherwise. Tummy Filling Factor : MODERATE. Should’ve had a side salad of some kind. Possum Friendly? MODERATE. The love puffs for us are as big as her head so probably not great to pick up… but Possum’s love puffs were a pretty good success. She did show a strong preference for the croquette mix and some yoghurt tonight. She was waving her arms around so much I thought she would fly away. And I will leave you tonight with a quote from a fantastic book. I would highly recommend. It taught my husband the language of food, and for that I am forever grateful.